Accel GM HEI Remote Mount Super Coils are engineered with optimized low resistance, high turns ratio windings around an M36 high silicone magnetic steel E-core for higher energy and voltage outputs. This results in quicker starts, improved idle quality, crisper throttle response and more high RPM power. Compatible with late model GM computer controlled remote mount HEI systems. Direct bolt-in ignition coil, plug-in replacement. Can also work with an Accel, Mallory, Crane, Holley and MSD capacitive discharge ignition system. Special high temperature epoxy resists shock and vibration, while increasing thermal conductivity. Brass coil wire contact increases energy transfer and resists corrosion better than aluminum. Comes complete with new mounting hardware. 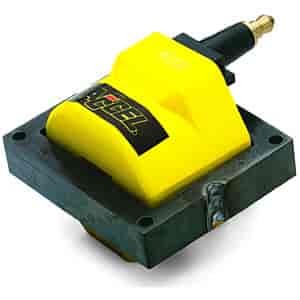 High dielectric strength ''Accel Yellow'' over the molded housing. Does Accel 140011 fit your vehicle? 140011 is rated 5.0 out of 5 by 4. Rated 5 out of 5 by Nathanhanover from Best! I had already put one on my 1996 Tahoe and that made a shocking improvement with the 5.7 Vortec. But I had already added a OEM Fit high flow Flowmaster exhaust. This went on my 1993 Chevy Blazer it already has the TBI Spacers. Truck had TBI 5.7 and I re-gapped the plugs to 0.65 WOW! 15 minute install, Plugs took about an hour. And I have to say there seems to be about 5 -10 more hp, also far greater torgue and power through 0-70 highway, -n- rolling take offs are far improved. Looking forward to putting on a High flow direct Fit exhaust from Flowmaster tomorrow and then towing my trailer to see how she tows now. 38000 volts are a Kick in the pants. Rated 5 out of 5 by Carlos Mar from excellent product. I have heard people mention not to waste your money on expensive coils because they are all the same, i'm sorry but thats not true. After installing the accel coil on my 1994 Corvette, I have notice better throttle, idle better, and resist the Laredo 110 degrees weather without hesitation.